"Chamisa must acknowledge Mnangagwa who Pastors at today's Prayer called "President!" said Deputy Minister of Information, Energy Mutodi in a video released on social media. It was clear in the voice and demeanour of the deputy minister that Zanu PF is desperately fishing for legitimacy! How can Mnangagwa be the legitimate president of Zimbabwe when the election process that had him declared the winner was so flawed and illegal it denied 3 million Zimbabweans in the diaspora the vote, it failed to produce something as basic as a verified voters' roll for Pete's sake. The real tragedy in Zimbabwe is the country is sinking deeper and deeper into this economic and political hell-on-earth our corrupt and incompetent politicians landed us into. What has been clear to anyone with eyes to see and ears to hear and a brain to perceive and comprehend is that Zimbabwe needs to replace the corrupt and incompetent political leaders who have dragged the nation into this hell-hole with accountable leaders with some common sense, at least. The nation has been stuck with corrupt and incompetent Zanu PF thugs who routinely rigged elections to stay in power. So to replace these thugs it was necessary to implement democratic reforms designed to stop Zanu PF rigging elections. Following the blatant cheating and wanton violence in the 2008 Zimbabwe elections, SADC leaders helped formulate an agreement, the Global Political Agreement (GPA), in which Robert Mugabe and his Zanu PF thugs agreed to the implementation of a raft of democratic reforms taking away the party's dictatorial powers including the carte blanche powers to rig elections. The task of implementing the reforms fell on Morgan Tsvangirai and his MDC friends. They had five years to implement the reforms and failed to get even one reform implemented. Not one! Robert Mugabe, who was State President in the Government of National Unity (GNU) created by the GPA, bribed the MDC leaders with ministerial limos, very generous salaries and allowances, a former white-own farm for Welshman Ncube (leader of the smaller of the two MDC factions in the GNU), a $4 million Highlands mansion for Tsvangirai, etc. The MDC leaders forgot about the reforms; they knew Mugabe did not want Zanu PF dictatorial powers watered down, much less scrapped! "Mazivanhu eMDC adzidza kudya anyerere!" (MDC leaders have learnt to enjoy the gravy train lifestyle and not to rock the boat!) Boasted Zanu PF cronies; commenting on why MDC leaders had failed to get even one reform implemented in five years of the GNU. When Mnangagwa seized power from Mugabe in the November 2017 military coup he promised to hold free, fair and credible elections. When he was reminded of the need to implement the democratic reforms ignored in the last GNU, he dismissed those calling for reforms as barking dogs. "Zanu PF ichatonga! Igotonga! Imi muchingohukura! Nokuhukura!" (Zanu PF will rule! And rule! Whilst you (calling for reforms) bark! And bark!) Mnangagwa said on a number of public occasions. No doubt said it all the time in private! Of course, Zanu PF blatantly rigged last July's elections. Mnangagwa is claiming that the elections were free, fair and credible and he is the legitimate winner but that is to be expect from a seasoned tyrannical dictatorship used to rigging elections and getting away with it. All the election observers worth their salt have all condemned the elections as flawed and illegal. "Major shortcomings in the pre-election environment impacted on the free expression of the will of electors, state resources were misused in favour of the incumbent and coverage by state media was heavily biased in favour of the ruling party," reported the EU election observer mission. "Further, the electoral commission lacked full independence and appeared to not always act in an impartial manner. The final results as announced by the Electoral Commission contained numerous errors and lacked adequate traceability, transparency and verifiability. Nelson Chamisa claims that he won the presidential race. This is laughable because the MDC Alliance also agrees with most if not all the flaws and illegalities in the process. In his Con-Court challenge of the presidential result Chamisa failed to produce all V11 forms to show where his 2.5 million votes had come from. It is common knowledge that the vote-count from some polling stations were never declared and the relevant V11 forms, if any were issued at all, were never made public; although this is a legal requirement. With no V11 forms it is impossible to verify vote tallies. So both Mnangagwa and Chamisa are each claiming to be the winner of an election so flawed and illegal each claims to have receive 2.5 million votes which is less than 3 million disqualified diaspora voters, using a voters' roll no one has ever verifies, no one can verify their claimed votes because neither can produce the V11 forms, etc., etc. In short we have Tweedle Dee and Tweedle Dum fighting over the wattle! "We as politicians are the trouble makers. We are responsible for the agony of our nation. I am ready any moment to meet Mnangagwa to resolve issues affecting Zimbabwe, any delay is a life lost," said Chamisa. Well Chamisa was right, when a nation has Tweedle Dee and Tweedle Dum for political leaders it is a recipe for disaster! The two can meet and talk till kingdom come about the usual trivial matters and share out the spoils of power just as they did during the 2008 GNU; nothing of substance came out then and nothing will come out this time. 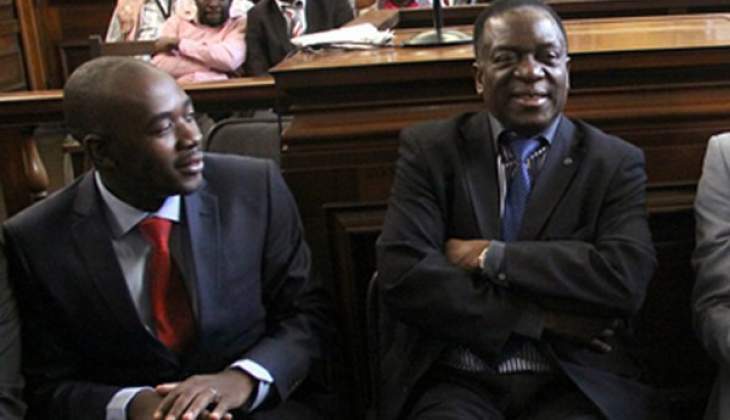 What Zimbabwe needs right now is for mentally challenged Tweedle twins and their followers to step aside to create the political space for the appointment of an interim administration tasked to implement the raft of democratic reforms which the twins failed to implement ten years ago. Zimbabwe is in serious economic and political trouble given the dizzying 90% unemployment rate, the all but collapse education and health service, etc. The anger and despair of the people of the last two weeks in January 2019 is a foretaste of more to come if nothing is done to bring about meaningful economic recovery. Zimbabwe needs to end this curse of rigged elections quick smart and cannot afford to waste time on these futile Tweedle Dee and Tweedle Dum dialogues!